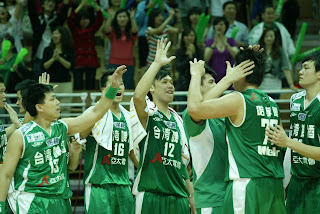 Lin Chih-chieh had 29 points and 9 rebounds and Ho Shou-cheng scored all his 12 points in the second half as defending champ Taiwan Beer routed Yulon 80-64 in Game 1 of the 2008 SBL Finals. Backup point guard Hsu Hao-cheng chipped in 11 points while starting center Wu Tai-hao had 10 points, 12 rebounds, 4 assists and two blocks for the Beermen. Lin had 16 points in the first half, when the Beermen overcame an opening 12-0 deficit and jumped in front 36-34 at the intermission. In the second half, Ho's scoring touch kept Yulon in a distance. Yulon's depth was never a factor in the game as it became a two-men team. Chen Chih-chung led with 22 points and Chen Hsin-an added 19 points and 7 boards, but none of their teammates scored more than 10 points. I had predicted in the preseason and in mid-season that TB would not repeat as champion because the team could never find a chemistry and share the ball. TB finished only 19-11 as the No. 3 seed coming into the postseason and that probably told you I was pretty smart. Nope. TB was a different team in the second season. Its three-game sweep of dmedia was a surprise. And judging from its play in Game 1, Taiwan Beer is back. At the same time, I couldn't help but wonder why that Yulon, which is as deep as Taiwan Beer, could never develop a right rotation under head coach Lee Yun-kwang. Starting center Tseng Wen-ting was never the same after his knee injury in the mid-season. Tseng, who was still dominant as late as the last season, scored only one point in Game 1. Newcomers yang Che-yi and Lee Chih-yi, both played for the national team, were also inconsistent.